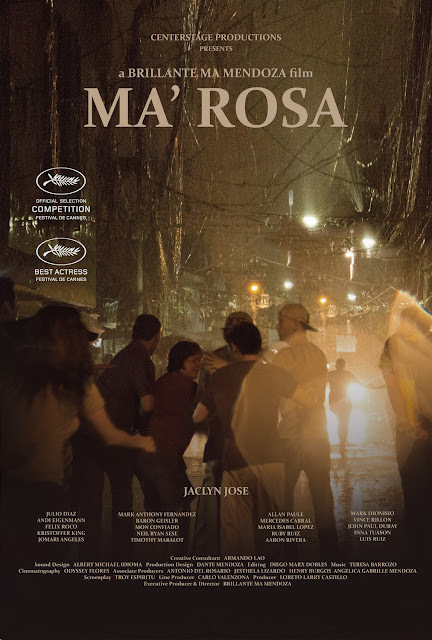 "Ma' Rosa", the latest movie from acclaimed director Brillante Ma Mendoza, is not a perfect movie, it has more ups and a few downs, but its eye-opening topic really makes it a very significant movie to watch this year. It's drug-related theme is very timely and politically significant as well. The almost experimental movie (entirely done without a script!) is such a brilliant idea that only director Brillante Ma Mendoza can perfectly crafted! Director Mendoza's attack in the film is somehow different from his other cinematic works. The overall feel of the movie are straightforward and no-holds barred. The filmmaking itself is not traditional, but you will feel the truthfulness in the final cut of the movie. "Ma' Rosa", if you will describe it, is subtle but fierce, silent but loud! Jacklyn Jose's performance in the lead and title role gave focus on the natural acting environment. She is a sheep in her acting that is waiting to bite big like a crocodile. Her acting is not flawless but you will feel the emotions in every line that she threw in every dialogues. And that last scene is simply stunning, she really deserved that Cannes Film Festival award and recognition! Overall, "Ma' Rosa" is not for everybody but everybody should be watching this film not because it is entertaining, but because this movie tackles the reality that is drug pushing and drug abuse as well. We give the movie "Ma' Rosa" an 8 out of 10 stars for blatantly exposing a portion of the bigger picture that is drug pushing and abuse. Watch the movie trailer for "Ma' Rosa".